The fifth annual East Harriet Neighborhood Fall Fest and Annual Meeting is scheduled for Saturday, Sept 23 from 11 am to 4 pm. East Harriet neighbors turned out on this fine fall day enjoying some great food and drink from Harriet's Inn while listening to live music on the MPRB showmobile. A big round of thank you's to all the participants, sponsors and volunteers that made our Annual Meeting and Neighborhood Block Party a big success! Harriet's Inn provided great food and beverages throughout the day. Jean Krantz-Swenson, Karen Heintz, Jenny Taplin, Melissa Gould, Ron Lagerquist and Bruce Wadman. And to Bethlehem Lutheran Church for allowing us to use their church building, grounds and parking lots for our event. Their involvement and help has made it possible to hold the block party. A special thanks to Maryjo Hackett of mjhackett design for volunteering her professional services to create the East Harriet Annual Meeting & Neighborhood Block Party postcard, doorhanger and flyer! 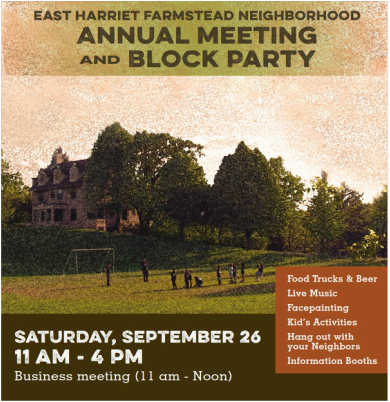 2015 East Harriet Annual Meeting & Neighborhood Block Party Postcard, Doorhanger, and Flyer Designed by Maryjo Hackett of mjhackett design. Childcare will be available for children 3 and over during the annual meeting. A local artist will engage the community both adults and kids in a meet and greet scavenger hunt, which will result in a canvas collaboration for all who participate at this neighborhood event.